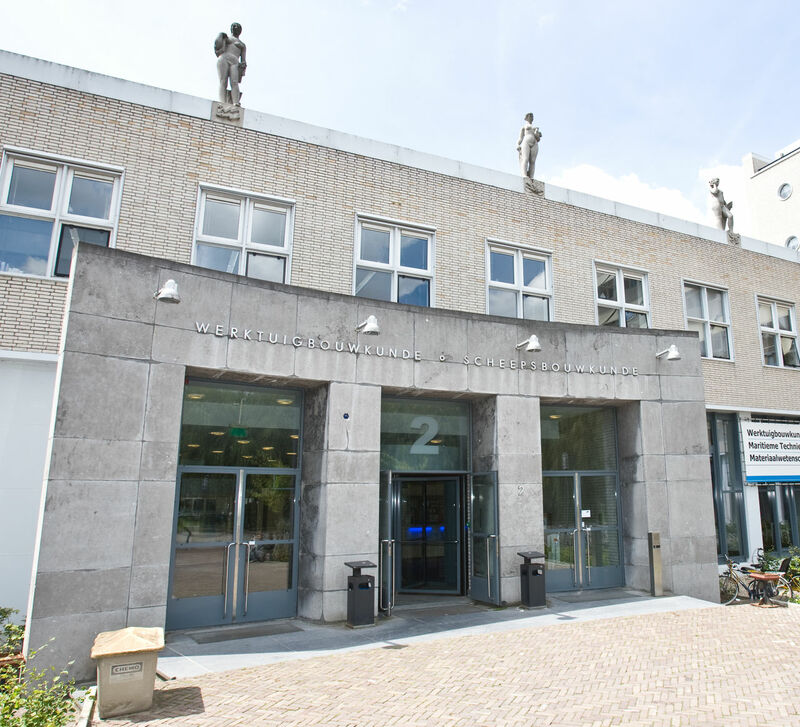 Since the start of the Delft Biorobotics Laboratory research has been done on the development of walking bipeds, based on the principle of passive dynamic walking. The backgrounds and history of this research are given in a separate document. All the walking and running bipedal prototypes and models resulting from the research are given below. 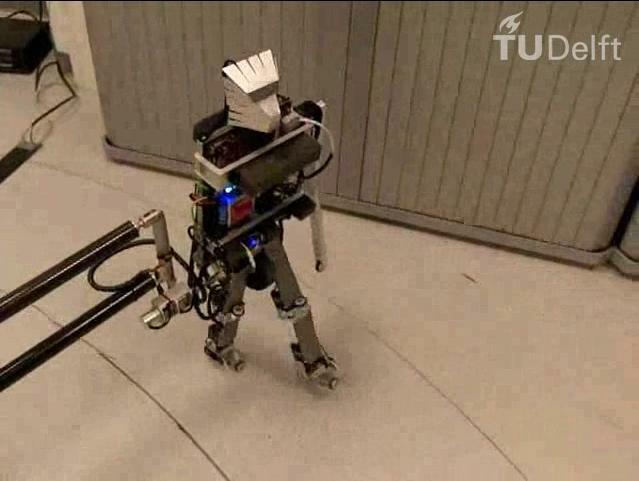 TUlip (2009) is a full 3D force-controlled walking robot with Series Elastic Actuation in several of its joints. 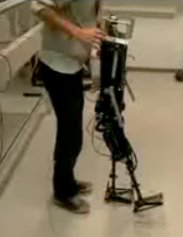 We are using it as a platform to test neuromechanical models of bipedal balance. 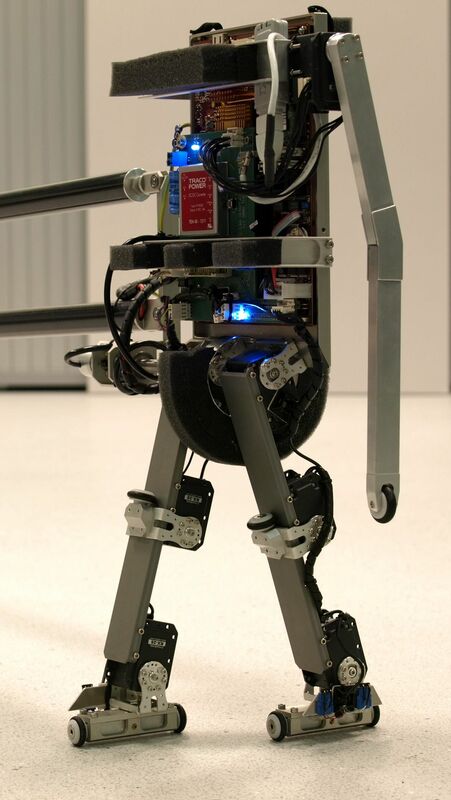 Phides (2012) 2D running robot with actuated hips and knees attached to a boom construction. The knee joints have a spring in parallel with the actuator for energy storage and release and have a spring in series with the actuator to reduce damaging impact forces on the actuator. Phides can run at speeds up to 1m/s and with a flight time of 54%. Leo (spring 2009) 2D robot with a boom construction, servo motors in the hips, knees, ankles and arm, designed for machine learning research. Able to stand up autonomously. Flame (fall 2007) 3D robot with series elastically actuated hips, knees and ankles and the ability to do sideways foot placement based on inertial sensor information. Meta (fall 2005) 2D robot with knees, ankles, and an upper body. The mechanical structure is mostly a copy of Max below. The major difference is the actuation; we implemented electric DC motors controlled by an onboard PC104 computer. Max (summer 2003) 2D robot with knees and an upper body. Uses McKibben muscles to provide minimal actuation to walk on a flat floor. Mike (fall 2002) 2D active walker with hip and knee joints. The hip actuation provides a remarkable amount of stability. Even standstill is in the attraction base of the walmotionking . Museon Walker (fall 2001) Fully passive demonstration robot. Robust, simple structure. We use this robot to demonstrate the basic principle behind all our walking robots: passive dynamic walking. 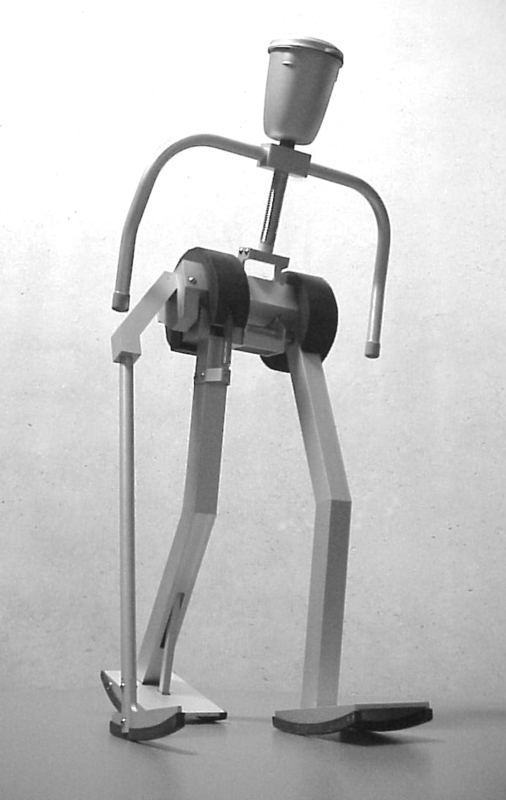 Baps (spring 2001) 3D Walking robot with phasic actuation and stiffness control. Actuation by leg extension and hip stiffness. Bob (spring 2000) 3D Walking robot without controls. Actuation by soleus stretch-reflex. Design as passive dynamic walker. Based on fully 3D dynamic simulation and stability analysis. Simplest Walker (fall 1999) Simplest Passive Dynamic Walker. 2D, straight legs. Walks on a tiled slope. After Tad McGeer's pioneering work on passive dynamic walking. Stappo (1995) 3D Walking robot without controls. Actuation by leg extension.